.. GIS tools & data resources that you can use for statistical mapping & visual data analysis … Geographic Information Systems (GIS) provide flexible and powerful capabilities to combine maps with data. In our increasingly data rich environment, we often experience “drowning in data.” GIS tools can help harness disparate and voluminous data and assist with data linkage. This section provides links to other sections that provide information on no cost GIS software and “production” GIS projects and datasets that you can use. 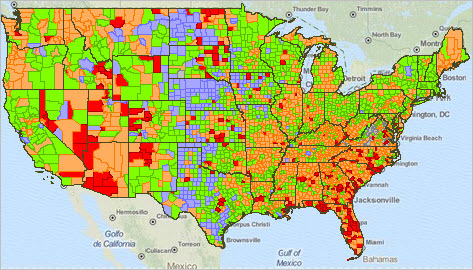 To illustrate, the following graphic shows patterns of per capita personal income change 2008 to 2014 by county relative to the U.S. See more information. Click graphic for larger view with legend and additional details. Make variations of this map view using resources described in this section. Optionally integrate your own data. GIS provides us with a way to improve collaboration; we can more easily comprehend and understand geographic relationships and patterns among “variables” and statistical data. As we reduce tabular data to visual representations, we are better able to communicate “what the data are telling us” among stakeholders and teams/committees. This second dimension, learning what the data are telling us, provides the power of creating insights for more effective decision-making. Most applications presented in this section involve use of Windows-based desktop GIS software. The software and GIS project files and datasets are installed on your computer. These resources are available for use by members of the User Group at no fee. Click a link below to view additional details about a topic of interest. There you find a description of the scope and use of the data/geography, steps to access and use the GIS projects/datasets and getting started tutorials. Applications make use of a range of statistical data from the Federal Statistical System, and other sources, integrated with shapefiles from the Census Bureau TIGER/Line shapefiles, OpenStreetMaps, and other sources. Join me in a Data Analytics Lab session to discuss accessing, integrating and using these resources … and linking these data/geography with other data that relate to your situation. This entry was posted in American Community Survey, Block Groups, BLS Local Area Unemployment, CA San Francisco, CA San Jose, Census 2010, Census Blocks, Census Tracts, Cities, Cities & Counties, Core-Based Statistical Areas, Counties, DC Washington, Geographic Information Systems, Houston ISD, Maps, NY New York City, NY Queens County, Patterns, Regional Economic Information System, School districts, Schools, Shapefile, States, Trends, TX Austin County, TX Dallas, TX Harris County, TX Houston, Urban, World Countries and tagged Dallas ISD, geographic information systems, GIS, Mapping Congressional District Demographic Economic Data, Mapping K-12 Schools and School District Characteristics, Mapping State by Block Group Demographic Economic Patterns, Mapping State by Census Block Demographic Patterns, Mapping State by Census Tract Demographic Economic Patterns, mapping statistical data, Mapping U.S. by City Place Demographic Economic Patterns, Mapping U.S. by County Demographic Economic Patterns, Mapping U.S. by Metropolitan Area Demographic Economic Patterns, Mapping U.S. by State Demographic Economic Data, Mapping U.S. by ZIP Code Demographic Economic Patterns, Mapping World by Country. Bookmark the permalink.